An Israeli police officer killed, on Saturday afternoon, a Jordanian citizen in the Chains Gate area, in Jerusalem’s Old city, after he reportedly stabbed and wounded a police officer. The Israeli Police said the man approached police officers and stabbed one in the upper part of his body, moderately wounding him. Israeli daily Haaretz said an officer, in his late thirties, was injured and was evacuated to Shaare Zedek Medical Center, after suffering moderate wounds, but remained fully conscious and in a stable condition, and later confirmed his death. It added that the Police “neutralized the assailant,” a term largely used by various Israeli media agencies, to indicate that the person was killed or seriously wounded. A video from the scene shows the slain person’s body on the ground, and a wounded Israeli police officer, with his gun drawn, standing nearby. Samri added that the attacker is a 57-year-old Jordanian man who entered the country a week ago on a tourist Visa, and added that the police is still investigating his background, including the reason for his visit. The slain Jordanian man was later identified as Mohammad Abdullah al-Kasaji. Palestinian sources said the officer who was injured is known to the worshipers, who frequent Al-Aqsa Mosque, for his repeated assaults against them, and that he was also involved in attacking and injuring many women trying to enter the holy site. Following the incident, the police and soldiers closed Bab al-Amoud and Bab As-Sahera, leading to the Old City, and pushed dozens of officers into the area. The soldiers also assaulted many Palestinians, and abducted one, before moving him to a nearby police station. 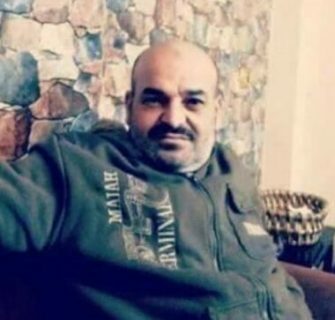 The abducted man, identified as Omran Rajabi, works as a guard of the Al-Aqsa Mosque and was taken prisoner after the fatal shooting, when he started filming soldiers who were attacking a Palestinian woman, trying to enter the mosque.